If you're looking for a great alternative to carpet then a natural fibre product may fit the bill. Choose from a variety of interesting weaves and colours in coir, sisal, seagrass or jute. Coir - made from the durable fibres of the coconut husk, the natural fibres are removed by hand, softened in sea water and woven into a selection of designs. Coir is durable and available in a range weaves and colours. Sisal - extracted from the Agave Sisalana plant farmed in Mexico, East Africa and Brazil, this durable and versatile natural fibre flooring makes an ideal choice for hallways and stairs. Tightly woven, hard-wearing and available in a range weaves and shades. Seagrass - grown in coastal meadows on the river banks of tropical climates in China and Vietnam, the natural fibre is harvested by hand, dried and hand spun before being woven into flooring. Mountain grass - distinctive and durable with natural irregularities and golden shades made from the outer fibres of the grass. Jute - from the stalk of the giant Corchorus plant grown in southern India, jute is soft under foot. The natural fibres are fine, making jute more suitable to relaxing rooms rather than heavily used areas. Naturally light brown in colour and woven in a tight boucle and herringbone design. 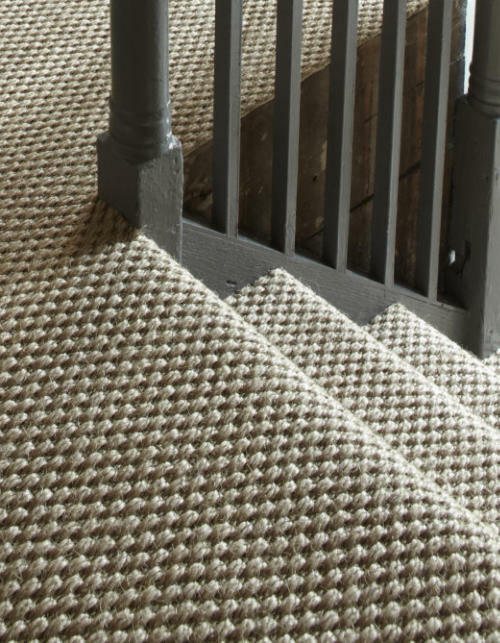 Natural fibre products require preparation and are fitted by our experienced team to provide a great natural alternative to traditional carpets. For those who don't want permanently fitted natural flooring we can provide custom made rugs and runners in almost any size.